Tread on this plant and you won't have to look down to know that it is a mint of some sort: the smell of crushed mint is unmistakable. 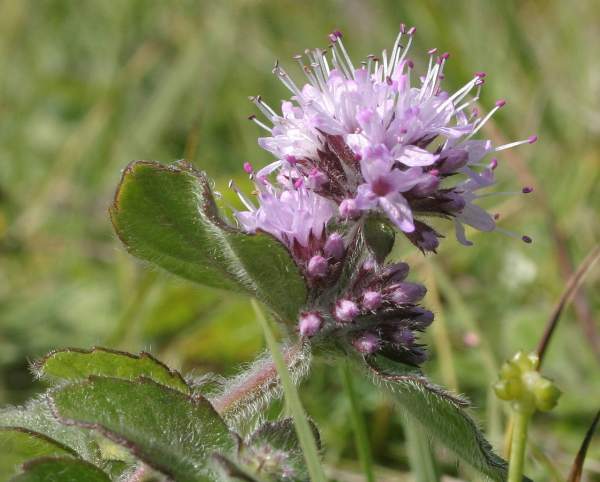 Water Mint is a perennial plant growing to nearly a metre in height when competing with tall vegetation, but more often no more than 20 to 30cm tall. The stems of this and other mint species are square-sectioned; they can be either green or purple, as also are the oval leaves. Another variable feature of Water Mint is the degree of hairiness of its leaves and stems, which on occasion are almost hairless. Typically 4 x 2.5cm the leaves are opposite and finely toothed. The flowers of Mentha aquatica are very small and form crowded near-spherical inflorescences. Each of the pinkish-purple flowers has a four-lobed corolla some 3-4mm long, and four protruding stamens. Below each whorl of flowers are a pair of opposite leaves. 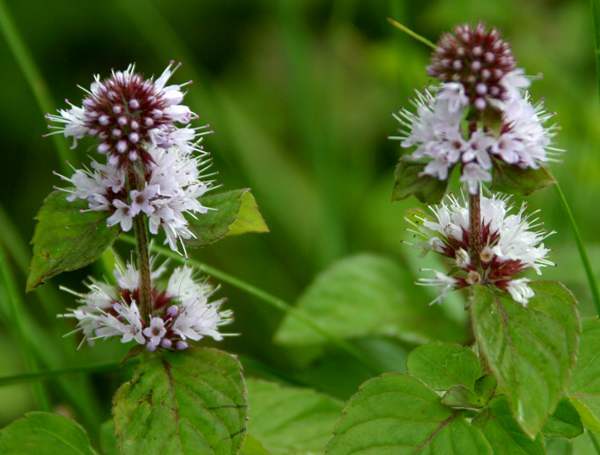 In suitable habitats Water Mint spreads rapidly by means of its rooting rhizomes. This plant is widespread throughout Britain and Ireland except for the far north of Scotland, and it is native to most of mainland Europe, northern Africa and western Asia. In the Americas, Australia and elsewhere Water Mint is an introduced species. 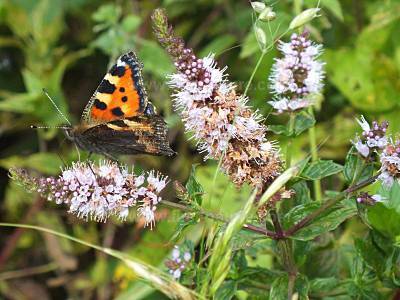 Water Mint is a plant of damp places. The margins of rivers, streams and canals are in places lined with this attractive low-growing plant, which also appears in peat bogs, wet agricultural grassland, drainage ditches and some alkaline fens. A variety of Water Mint with bronze leaves is more often found by ponds and other still waters. 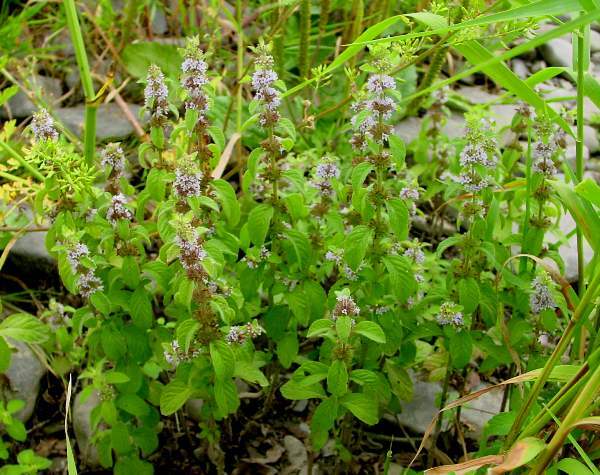 In Britain and Ireland Mentha aquatica is in flower between early July and late October. Water Mint has both culinary and medical uses. Water Mint tea is considered to be effective in settling upset stomachs and to be a mild sedative; and in the Middle Ages Water Mint plants were strewn on the floors of banqueting halls so that as guests came in odours of mint would be released. Mentha, the generic name, comes from Greek mythology, in which the naiad Minthe (variably spelt also as Menthe, Mintha or Mentha) was transformed into a sweet-smelling mint plant by Persephone, daughter of Zeus and queen of the underworld. The specific epithet aquatica means, just as it sounds, aquatic - of water. Spear Mint Mentha spicata has, unsurprisingly in view of its common name, a spear shaped terminal flower (at the top of the stem). Corn Mint Mentha arvensis is easily distinguished from other mint species because it does not have a flower head at the terminal. The Water Mint plants shown on this page were photographed in West Wales. Above: Peppermint, Mentha x piperita, is an infertile hybrid with Water Mint and Spearmint Mentha spicata (sometimes written as Spear Mint) as its parent plants.